Pub, Tavern, Beerhouse - what's the difference? How many pubs did Yeovil have? What is the greatest number of pubs at any one time?
. . . and Breweries? Where have all the old pubs gone? I suppose I ought to say it up front - I quite like beer. When I first moved to Yeovil, Somerset in 1973 I had a map on the wall of my office with a red dot for each of the pubs in town I had visited within the first year of moving to Yeovil - all 40 of them. (I also had another map showing over 150 additional pubs that I'd visited in south Somerset and north Dorset during the same period - but that's a story for another day). In 2012 I spent a pleasant Friday afternoon wandering around some half dozen of Yeovil's finer watering holes with a couple of chums. Not for the first time it cropped up in our conversation about how few pubs there were in Yeovil these days, at least within walking distance of each other - bearing in mind we'd just sauntered the length of Railway Walk from the Royal Marine to the Railway. All three of us have lived and/or worked in Yeovil since the 1970's (and all three of us spend a lot of time in pubs) so we collectively reminisced and tried to count the number of surviving hostelries and came up with a figure of just over 25 - there are, in fact, more like 35 but we had been drinking! The next day I began to wonder what had happened to all the old pubs I'd known and, indeed if there were any more that I didn't know about. So I began delving into the history of yeovil's pubs - and this section of the A-to-Z of Yeovil's History website is the result. Enjoy. Cheers. The establishment must have been licensed to sell beer, ale or cider - thereby excluding the various temperance establishments our Victorian forbears were so fond of. The establishment had to be open to the general public - thereby excluding private hotels, clubs and institutions but including bars of some hotels. The establishment had to have a name - thereby excluding the majority of simple beerhouses (see below) but including those with names such as the Coach & Horses, Hop Vine Inn, Lamb Inn, Running Horse Inn and the Stags Head Inn. This is a somewhat arbitrary decision on my part (but I had to draw a line somewhere) as it might include pubs that may have been very short lived or were simply pretentious beerhouses like those listed above, but on the other hand dismisses long-established beerhouses like that at Rustywell that was selling cider in the 1870's and continued to do so well into the 1930's - but it still didn't have a name. In pre-industrial England there were basically three types of victualling house which, in declining order of size and status were the inn, the tavern and the alehouse. In common parlance in the recent past, the terms alehouse (later public house or pub), tavern and inn were generally interchangeable, today even more so. For example the establishment in Silver Street, known by one and all simply as 'The Pall', has officially been known at various times as the Pall Inn, the Pall Hotel and the Pall Tavern. However in the past there was a three-fold categorisation recognised in statute and common law with each type of establishment having a particular meaning and each being readily distinguishable. In early times inns were usually large, fashionable establishments with a license to put up guests as lodgers offering wine, ale, beer and (specially in Somerset) cider, together with quite elaborate food and lodging to well-heeled travellers. The inn was the precursor to today's hotel but inns historically provided not only food and lodging, but also stabling and fodder for the traveller's horse(s). Coaching inns stabled teams of horses for stagecoaches and mail coaches and replaced tired teams with fresh teams. Typical coaching inns in Yeovil included the Angel, Castle, Mermaid and Three Choughs. Because the passengers of coaches had tended to be the middle or upper classes of society, coaching inns were more likely to be superior establishments that catered for the comforts demanded by these classes. The great heyday of the coaching inns was from the post-Restoration period, climaxing in the 18th and 19th centuries, but by the 1850's their eventual demise was inevitable with the arrival of the railways that changed society with the new concepts of immediate and relatively inexpensive travel. A tavern generally did not have the extensive accommodation that an inn could offer, indeed most early taverns did not offer accommodation at all. The tavern was more a place where people gathered to drink alcoholic beverages and be served food although, in earlier times especially, there was little of the expensive feasting seen at inns. The tavern traditionally served wine to its more prosperous clientele whilst the inn served wine, beer, ale or cider although by the 19th century this distinction was more than a little blurred. Since wine was far more expensive than ale or beer, taverns tended to cater to richer patrons who could afford it. They were usually restricted to towns and hugely outnumbered by alehouses. While the numbers of taverns had never been great (nationally they only accounted for less than 5% of licensed properties), the heyday of the old-style tavern was waning fast by the end of the 18th century. From the medieval period alehouses were much smaller premises, often ordinary dwellings where the householder served home-brewed ale (at this time ale was essentially un-hopped beer and more simple to brew than beer with hops) or cider. If lodging for travellers was offered, this might be no more than bedding on the floor in the kitchen, or in a barn. The term alehouse was gradually replaced by public house during the 18th century. Descended directly from the alehouse a public house, informally known as a pub, was essentially a purely drinking establishment offering neither food nor accommodation. 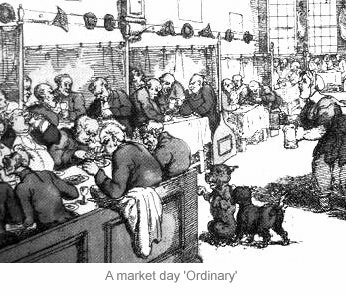 By the late 19th century this distinction was beginning to blur as several public houses were advertising "An Ordinary on Market Days" where an Ordinary was, strictly speaking, a set meal taken at a communal table. The Butchers Arms, for instance, offered hot beef dinners with vegetables for 6d or hot tripe dinners with vegetables for 4d. This was actually a hangover from the 18th century when an Ordinary was a specific type of tavern that would offer meals to gentlemen who could afterwards indulge in moderate gaming. Public houses in the 19th century were issued with licenses by local magistrates under the terms of the Retail Brewers Act 1828, and were subject to police inspections at any time of the day or night. Public houses, especially those built from around 1850 onwards (and usually built by the breweries), tended to be multi-room establishments with each room designed for its own its own purpose, developing for instance to become the saloon, public bar, snug, games room, dining room, upstairs meetings rooms for societies and associations, the off-license (a product of the 1834 Act) and so on. A beerhouse was a new, lower tier of drinking establishment permitted to sell alcohol created by the Beerhouse Act 1830 (see above) in which a beerhouse was defined as "where beer is sold to be consumed on the premises". Those running beerhouses had only to buy a license costing two guineas per annum (£2.10). During the 19th century, following the Beerhouse Act 1830, many beerhouses would have been what we call brewpubs today. In other words they brewed their own beer on the premises or, more likely for Yeovil considering it was closely bounded on all sides by extensive orchards, cider. During the middle part of the 19th century an estimated minimum thirty to forty beerhouses were to be found in Yeovil alongside the fifty or sixty 'proper' pubs, inns, taverns, etc. On the other hand, as stated above, many beerhouses became relicensed as public houses after a few years if they didn't disappear altogether. As with other tradesmen of the time, alehouses, inns and taverns would advertise their business with a sign hanging outside. A pole above the door garlanded with foliage, for instance signified an alehouse. Beginning in the 14th century inns and taverns would often display a pictorial sign by which they could be identified in this illiterate age. From the 16th century many alehouses also began hanging pictorial signs. The tradition, of course, continues for licensed premises. For a complete guide to the Drinking Laws of England - click here. The selling and consumption of alcohol was largely unregulated until the Alehouse Act 1552 when alehouses came under the control of local Justices of the Peace who issued licenses and controlled the numbers of licensed premises. Thereafter anyone who wanted to sell ale had to apply for a license at the Quarter Sessions or the Petty Sessions. In addition alehouse keepers had to declare that they would not keep a ‘disorderly house’ and prohibit games of bowls, dice, football and tennis. In the 'Smale Book' of the Clerk of the Peace of 1593-5, is the entry "William Strong and Hugh Plattyn, both of Yeovil, and Joan Pawley of Preston (Plucknett), widow, for selling ale contrary to the statute." Apparently William Strong was discharged but Joan was 'outlawed'. In the same book, a few pages further on we find Hugh Plattyn mentioned again, being brought before the Justices "for an unlicensed and disorderly alehouse." In 1617 the requirement for licenses was extended to inns. For example in 1617 "John Witticke of Evell, his license taken from him, and to tipple no more." (Ivelchester Sessions, 29,30 April, 1 May 1617 - SRS.23.206). However, it appears that Yeovil had far too many alehouses than was needed, resulting in a petition by the townspeople as recorded in the Somerset General Sessions held at Taunton in July 1618 "On a petition by the inhabitants of Evell that the number of Alehouses doth far exceed that for which they have occasion; Ordered that there shall be only nine allowed within the burrough and two without, and those to be kept by such persons as by Sir Robert Phelipps and Sir Edward Hext, knts., justices for that limit, shall be thought fit; who have likewise order from this Sessions to suppress the others." All fared well for many years until, first imported from the Netherlands in the 1690s, gin in various forms began to rival beer as the most popular drink in England. In 1690 William III recklessly dissolved the Distiller's monopoly and allowed anyone to start a distillery by giving ten days notice to the excise. After 1694 gin cost less than beer and this was not the gin we know today but about double the strength! By 1714 there were over two million distilleries in the UK and by 1735 the number was in excess of five million. By 1742 a population one tenth the size of today's was consuming around nineteen million gallons of gin a year - ten times the UK's current annual gin consumption. During the early 18th century the government permitted this unlicensed gin production and at the same time imposed a heavy duty on all imported spirits. This effectively created a market for home-produced cheap gin and thousands of gin-shops sprang up throughout England, a period known as the Gin Craze. 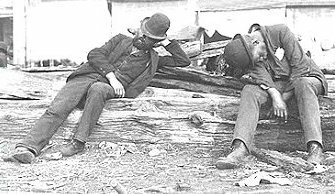 It has been estimated that at any given time during this period a quarter of the population of London, for example, was permanently inebriated. The 18th century consequently saw a huge growth in the number of drinking establishments, primarily due to the introduction of gin. By 1740, the production of gin had increased to six times that of beer and, because of its very low price, was extremely popular with the poor of which Yeovil had many. The Sale of Spirits Act 1750 (commonly known as the Gin Act 1751) was enacted in order to reduce the consumption of spirits that was regarded as one of the primary causes of crime, especially in larger conglomerations such as Bristol and London. The drunkenness and lawlessness created by gin was seen to lead to the ruination and degradation of the working classes. William Hogarth’s prints Gin Lane and Beer Street, both 1751 and shown at left, depict the perceived evils of the consumption of gin as a contrast to the merits of drinking beer. Hogarth portrays the inhabitants of Gin Lane as being destroyed by their addiction to the foreign spirit of gin, while those who dwell in Beer Street are seen as happy and healthy, nourished by the native English ale. The licensing system was overhauled in 1828 with a new Alehouses Act that provided a new framework for granting licenses to sell beer, wine and spirits and for regulating inns. But in order to combat the apparent national rise in drunkenness the government enacted the Beerhouse Act 1830 which had been pushed through Parliament by the Duke of Wellington who saw drunkenness as endemic among some sections of the working classes. The Beerhouse Act 1830 was seen as an attempt to wean the English off spirits, especially gin, by actively liberalising the regulations and increasing competition in brewing and the sale of beer. According to the Act it was considered "expedient for the better supplying the public with Beer in England, to give greater facilities for the sale thereof, than was then afforded by licenses to keepers of Inns, Alehouses, and Victualling Houses." 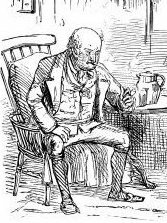 Under the 1830 Act any householder who paid rates could apply for a license to sell beer, ale, porter, cider and perry and set up a so-called beerhouse, usually in his own home, without recourse to the Licensing Justices. The license would also allow him to brew his own beer, cider, etc. on the premises although only three Yeovil beerhouse keepers were recorded as being a brewer as well as a beerhouse keeper. The license cost a one-off payment of two guineas - £2.10 in today’s money but about £160 in today’s value. The license did not allow the sale of spirits or fortified wines, and any infringement would result in the beerhouse being closed down and the owner heavily fined. Beerhouses were not permitted to open on Sundays. The beer or cider was usually served in jugs or dispensed directly from tapped wooden barrels on a table. It was not uncommon that, because of the high profits involved, the licensee was able to buy the house next door to live in and turn every room in his beerhouse into drinking rooms for customers. It should, of course, be remembered that the quality of home-brewed beer or cider was always going to be variable at best and many beerhouse owners never intended brewing their own but to buy in from local breweries. The brewers, on the other hand, found the meager amounts sold to beerhouses to be of little overall value and, in the main, the breweries began to direct their energies towards tied houses. One way to combat the rise of the beerhouse was for the breweries to begin building their own pubs which would be tied to the brewery and many pubs starting life in the 1840's and 1850's fell into this category - possibly the Crown Inn, Duke of Wellington, Elephant & Castle, Globe & Crown, Somerset Inn and the Victoria Inn fall into this category. Nevertheless, by 1840 there were 46,000 beerhouses nationwide and, because it was so easy to buy the license and its cost was so low in comparison to the huge potential profits, the number of beerhouses continued to rise dramatically - to the extent that nearly every street had at least one, if not more, beerhouses. Moreover, many of Yeovil's beerhouses were to develop into fully-fledged public houses - for example the Albion Inn, Anchor Inn, Beehive Inn, Bricklayers Arms Inn, Britannia Inn, Globe & Crown Inn, Hop Vine Inn, Market House Inn and the Seven Stars Inn - albeit with many being refashioned or even completely rebuilt in the following decades. Perhaps realising its mistake, the government quickly introduced new licensing laws to curb the expansion of beerhouses. The 1834 Act, for instance, sought to improve the character of beerhouses by raising the license fee to three guineas and required certificates of character for prospective licensees. The new laws eventually made it much harder to obtain a license and by the time of the 1869 Act, the basis of today's licensing laws, effectively prevented new beerhouses being created. Nevertheless, those already in existence were allowed to continue and many did not close for many years – that in Rustywell, for instance, was still operating in the 1930’s and the Royal Marine, typical of many establishments, only obtained a full public house license in 1935. Yeovil has, apparently, always had a large number of ale houses. In 1618 an order was made that only nine be allowed in the borough (that is the town, not that part of High Street today called the Borough) and two outside, with the rest being 'suppressed'. A glance across to the maps at left, however, will show that the Borough of Yeovil at this time was about a hundredth of the size of Yeovil today! Included within the nine were, most likely, the Angel, the Bell Inn, the White Hart (later renamed the Castle), the Lyon Inn, the Mermaid, the George (in High Street), the Rose and Crown and the Three Cups that was later renamed the George (in Middle Street). Of course the borough itself at the time was extremely small as seen in this map, comprising little more than a few streets east and south of St John's church (today's High Street, Middle Street and South Street as far as the Triangle and Vicarage Street - now the Quedam shopping centre). By the 19th century, the number of public houses had swelled considerably, but so too had the size of the town's boundaries. So, bearing in mind the above provisos we end up with a list of 164 named pubs on the Pubs by Name page, although several had more than one name such as the Queen's Arms that became the Royal Oak that became the Hole in the Wall or the White Hart that became the Higher Three Cups that became the Castle Inn. If these multiple-named inns are listed as single establishments the list reduces to 135. This number does not include the vast majority of beerhouses created by the Beerhouse Act 1830 (see above). 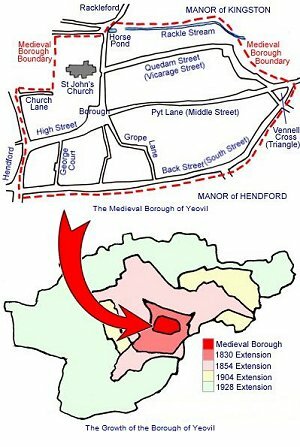 The map of Yeovil above has a small blue square indicating the distribution of pubs (not beerhouses) in the town, now no longer with us, and a red square for today's pubs. Indeed quite a few beerhouses evolved into fully licensed public houses, but it isn't always easy to tell them apart in the records. 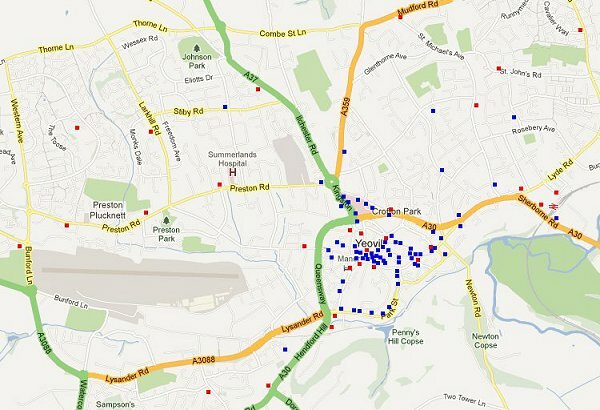 What is the greatest number of pubs in Yeovil at any one time? From the early nineteenth century Yeovil developed into one of the country's main centres for leather production and glove making. Documentary sources indicate that by 1840 approximately 75% of the town's population were employed in the leather or gloving industries. Also, as these industries grew, so the population of the town grew - fourfold between 1801 and 1851 (2,774 to 8,739). It remained Yeovil's principal industry throughout the nineteenth century and continued to thrive until the mid-twentieth century. This meant that the town had large numbers of skilled, semi-skilled and unskilled workers and for the majority one of the few pleasures in life would have been a pint or two of cheap ale. The growing number of beerhouses and public houses in the town during the first half of the nineteenth century was really the result of a growing service industry catering for the burgeoning working population of the town. Also it seems that, after the Beerhouse Act 1830, quite a few glovers and leather workers, as well as other tradesmen, managed to scrape together the required two guineas for a license to open their own beerhouse, often as a sideline to bring in extra money or as a complete change of occupation. It was extremely common for licensees, particularly in smaller establishments such as beerhouses, to work only part-time, combining run a bar with other work. During the day running the pub was left in the hands of his wife and other members of the family. A number of women also ran pubs, often taking over on the death of their husbands or fathers. Hunt’s Directory of 1850 lists fourteen hotels and inns, forty beer retailers and five wine and spirit merchants in Yeovil. This probably justifies the thought that quite a few public houses started life as beerhouses. Slater’s Directory of 1852 lists two establishments (the Mermaid and the Three Choughs) in the “Inns” category and seventeen further establishments in the “Taverns and Public Houses” section. Additionally twenty nine individuals were listed as “Retailers of Beer” and five as “Wine and Spirits Merchants”. Of course, these directories were, in themselves, incomplete and both miss several establishments. It's not really easy to distinguish between beerhouses and public houses in the early part of the nineteenth century but in the 1870's there were 63 pubs in Yeovil, 62 in the 1880's, 61 in the 1890's and 58 in both the 1860's and the 1900's. Indeed between the 1860's and the 1960's there were always more than 50 pubs (by my definitions above) in the town. Additionally it has been estimated that, between the 1840's and 1880's, there were probably some 40 licensed (albeit un-named) beerhouses at any one time. Of course, as mentioned above, during the 19th century the population of Yeovil was growing, from 2.774 in 1801, to 5,590 in 1821, to nearly 13,500 by the 1890's. Nevertheless during the period of the 1850's, '60's, '70's and '80's there was always 1 pub for less than 200 Yeovilians (or 1 pub / beerhouse for about 90 Yeovilians). Today's figure is still a quite impressive 1 pub for approximately every 1,000 Yeovilians. Check out the stats on the Timeline page. Bearing in mind that the Beerhouse Act 1830 permitted the licensee to brew his own beer and/or cider, the only premises actually recorded as having their own brewhouses were the Mermaid and the Three Choughs. 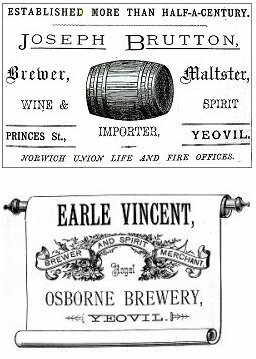 However there were probably quite a few 'microbreweries' in Yeovil during the 1830's and 1840's although, as stated above, only three beerhouse keepers, George Raymond of Hendford, William Phelps of the Sun House Inn and George Cole of the Lamb, were recorded as being a brewers as well as a beerhouse keepers. The produce must have been variable to say the least and, although the practice of brewing your own undoubtedly carried on, by 1852 Slater’s Directory was listing two “Brewers and Maltsters” – Thomas Cave and Edmund Henning (who rented the George in Middle Street), both of Hendford. Henning's brewery was opposite Hendford House, now the Manor Hotel. It was noted as the 'Old Brewery' in the 1846 Tithe Apportionment suggesting that it pre-dated Cave's brewery. Also, buying in ale was an attractive proposition for most beerhouse keepers for three very practical reasons. Firstly the brewing process was fairly complicated and also required a capital outlay for equipment. Secondly the quality of the beer could be assured if bought in from a professional brewer. Finally, keeping a beerhouse was, for many, not their prime occupation and their time was therefore at a premium. Many a beerhouse keeper's wife ran the bar during the day while the husband took over in the evening having worked all day. Joseph Brutton, formerly of Exeter, lived at 7 Princes Street ( 1881 census) with his wife, eight children and five servants. He is recorded as employing 36 men and 3 boys in his brewery (Brutton’s Beers). Brutton’s brewery was located between Princes Street and Clarence Street with a malthouse on the western side of Clarence Street on the land now occupied by Tesco’s car park. A covered footbridge connected the two sites in recent years. Joseph Brutton’s brewery was established in 1825 in Clarence Street - originally starting life as Kitson and Cave's, subsequently Cave's and was in co-partnership with Thomas Cave by 1854 as Cave and Brutton's, before becoming J Brutton & Sons Ltd. This was to become the largest of Yeovil's breweries, finally being acquired by Charrington & Co (South West) Ltd. The brewery was demolished in 2003 and the site redeveloped as housing. Thanks to Mike Hine for the following memory - "I recall their beer as being nasty, thin, sour piss-water. It could have been that I was too young to appreciate its qualities." The later Royal Osborne Brewery was in Sherborne Road and also had an aerated water works at the rear of the premises. Its location was next to Osborne House and is currently the site of a car park. Finally it ought to be remembered that breweries outside Yeovil also supplied the town's pubs - the Limington Brewery in Ilchester, Crewkerne United Breweries (with a store at 12 Princes Street, Yeovil), The Dorsetshire Brewery Company in Sherborne and Berryman, Burnell & Co's Charlton Brewery at Shepton Mallet (with offices and stores in Court Ash, Yeovil). Today, of course, the Yeovil Ales Brewery produces some really cracking ales that are available throughout the area. Several of Yeovil's pubs closed around the late 1900's or early 1910's - the Anchor Inn, Chough's Tap, Cow Inn, Cross Keys, Dolphin Inn, Seven Stars Inn, South Western Arms and the Victoria Inn. The most likely cause of these closures was probably the Licensing Act 1904. At this time there was a strong temperance movement in England (not just Yeovil where there were at least two temperance hotels and the Temperance Hall) and a general feeling that there were simply too many public houses for the public good. The Licensing Act 1904 introduced a national scheme whereby (in theory at least) a licensee surrendering his license would receive compensation. Under the Act licensing magistrates could refuse to renew a pub’s license if it was considered that the pub was unnecessary to provide for the needs of the public. Compensation could be paid both to the owner of the premises and the licensee although only about 10% went to the licensee. This compensation was paid for by a levy on the licenses granted to other premises. This provision of the 1904 Act was carried forward into the Licensing (Consolidation) Act of 1910. On a different note, it is worth mentioning that up to the middle of the 20th century the vast majority of Yeovil's licensed premises were what might be classed as town centre pubs simply because the town itself was relatively small (see maps above). Many of these were swept away in the wholesale redevelopment of Yeovil between the 1960's and the 1980's with (in more or less chronological order) the building of Wellington Street flats (Royal Standard, Wellington Inn) development of the Glovers Walk shopping complex (Coronation Hotel, Railway Inn), the widening of Reckleford and Kingston to dual carriageway standard and the building of the new hospital complex (Market Street Inn, Nags Head Inn, Red Lion Inn, White Lion Inn), the building of the Quedam shopping centre (Albion Inn, Anchor Inn, Britannia Inn) the building of Queensway (Victoria Inn, White Lion) and the building of the Tesco store (Crown Inn). Another prime cause of pubs being lost were the ubiquitous road widening schemes (Cross Keys, Dolphin Inn, George Inn, Globe Inn, Golden Lion Inn, Oxford Inn, Rifleman's Arms Inn, Volunteer Inn). Of course, with the increase in pub closures over the past few years and bending to the pressures of modern economics some former pubs have been converted into flats (Glovers Arms, Nelson Inn, Three Choughs Hotel, White Horse Inn) or demolished and replaced by small blocks of flats or other accommodation (Alexandra Hotel, Somerset Inn, Sun Inn, Westfield Hotel). On the flip side, as Yeovil's population expanded, much new housing was built on the edges of the town leading to a surge of building new 'estate' pubs, especially during the 1950's (Fleur de Lys, Green Dragon, Milford Inn, Royal Standard, Sun Inn, Yellow Wagtail). Many of these are now looking a little 'tired' or have disappeared completely. More recent additions include Airfield Tavern, Arrow, Beach and Modello.